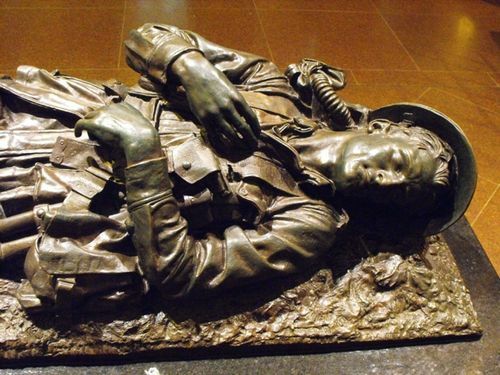 Lifelike bronze of a fallen soldier in St Mary's Cathedral commemorates all who have died in service or have been killed in action in the conflicts in which Australia has been involved. It was designed by George Lambert in 1928 and cast by A B Burton, as a gift of the Roman Catholic sailors and soldiers. It is a simple image of a typical Australian digger portrayed with a bullet hole in his left breast, with the uniform recreated with great accuracy. This sculpture to the Fallen was unveiled on 26 July 1931; moved to the Crypt in 1937; and relocated on the south western corner of the Cathedral in 2004. SYDNEY, Thursday. In the full radiance of the light that spllls and stains the stone under the soaring Gothic Windows of St. Marys Basilica, the Lambert war memorial rests in the chapel near the Altar of the Sacred Heart. It is the bronze figure of a recumbent soldier with arms folded and eyes closed in death. The uniform bears the impress of conflict. Even the shoes are worn and begrimed. But the countenance is one of complete serenity and fulfilment. It is a face of final and lasting peace, full of gravity and quiet content. A spiritual quality is imminent in every line. The genius of Lambert has reached its topmost flight in this work. All Sydney will feel its magnetism. This masterpiece of both representation and symbolism was unveiled by Archbishop Kelly with a pomp and high ritual which gripped the congregation in the vast cathedral. Several thousand people were present, among them the leaders of society and of political and civil life. It took more than an hour for them to file past the memorial at the close of service. Evening News (Rockhampton, Qld), 31 July 1931.